"No need to run our races in Lederhosen"
A back to the basics low fee trail run. Trail running and ultra running is growing fast. As races start to sell out across the country, entry fees for these races seem to go up almost as fast as we have seen the last couple of years in the road running scene. Some bigger ultra trail runs are now owned and operated by bigger for profit corporations and fees for these races are now hundreds of dollars. Running some of these big name destination races might be cool, but it is something most of us can only afford once or twice a year. Many trail-runner do enjoy racing often throughout the year. So where can you race the rest of the year, preferable locally and for little money? The Naked Nick is a great option to run/race locally for a very low entry fee. This is only possible because we chose a location that does not slap us with big permit fees (please consider a donation to support Blue Marsh Lake), we don't give you expensive swag ( hence the Naked Nick) because most of you don't need another race shirt or a flashy 3 pound medal (we will give a little finisher memento)and we are not hiring some aging rockband to entertain you along the course . 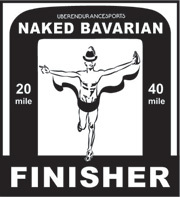 The Naked Bavarian takes place on the trails around Blue Marsh Lake. These trails are not very rocky or difficult but are true single track trails that require some attention. These trails are great for beginners and the speedy runners alike. 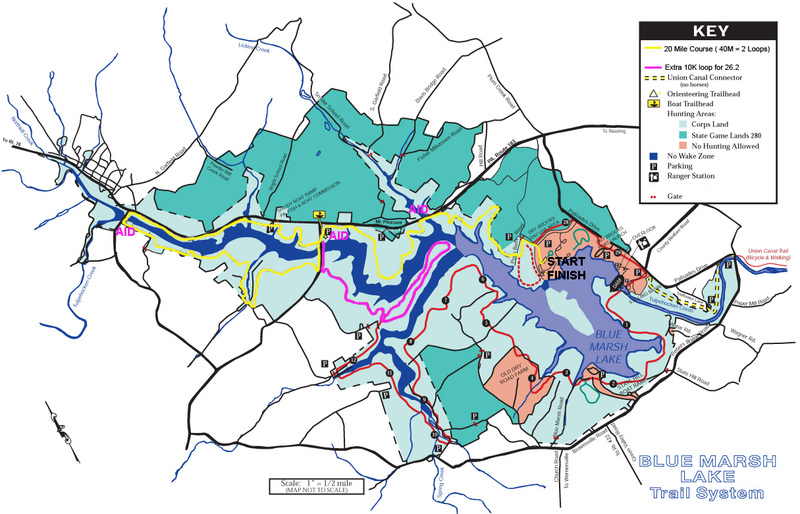 The rolling elevation of the trails will keep everybody occupied. The course is not flat or supereasy but is doable for most with proper training. Join us to start the new trail running season. Old fashion tear-off bib timing. Keep your bib visible on font at all times. You have to finish the distance you signed up for , you can not drop to a shorter distance during the race. Trail runners usually carry a bottle to keep hydrated between aidstations. Gatorade and water will be available at all the aidstation. There will be the usual snacks and carbs to keep you fueled at the race (bring your own gels, if you rely on them). Along the trails of Blue Marsh Lake. This course will be on the north side of the lake .Basic course is a lollipoop. 6.5 Miles out, 7 Mile loop and 6.5 Miles back. 40 Mile runners do it twice ( access to your dropbag at mile 20). Mix of single track trail 80% and gravel gravel roads 20%. We will hand out the awards as runners cross the finish line. Post race food provided by a chef and a pastry chef.